Did KRONA's come in any other color combo than chrome and black handle? There's the all black plastic handle, except for a chrome ring between the handle and the tip, and there a version with a black plastic handle with a chrome tip. There may be others, but I just bought these two versions a few days ago. (12-31-2012, 08:09 PM)5Savages Wrote: There's the all black plastic handle, except for a chrome ring between the handle and the tip, and there a version with a black plastic handle with a chrome tip. There may be others, but I just bought these two versions a few days ago. Those are the only two versions with which I'm familiar. The chrome-tipped one with plain unlettered silo doors apparently was the earlier model, followed by the later one with the all-black handle and both doors saying "Schick." Thanks. Henry Ford must have had a say so in the black only color. Then there is this one which is NOS original not a replated razor. (12-31-2012, 08:13 PM)churchilllafemme Wrote: Those are the only two versions with which I'm familiar. The chrome-tipped one with plain unlettered silo doors apparently was the earlier model, followed by the later one with the all-black handle and both doors saying "Schick." My Krona with the all black handle says "Schick" on one door and "Krona" on the other. Wow, that was an incredible find. What a glorious looking razor. Not a great pic, but the only one I have from the time that I owned all three. From left to right: gold Krona, standard black Krona, gray Eversharp version (Eagle logo on the tip). Beyond this, there are a bunch of more subtle variations such as short tip vs. long tip; the types of logos on the head; plastic tip vs metal tip, etc. There are some good pics here on B&B. I like longer handled razors due to my recent and permanent hand injury and the KRONA's handle length and shape appeal to me. They don't seem to command the prices that Gillette's do either. (01-01-2013, 11:53 AM)Blue line Wrote: I like longer handled razors due to my recent and permanent hand injury and the KRONA's handle length and shape appeal to me. They don't seem to command the prices that Gillette's do either. Blue line, first let me say that I am sorry to hear about your hand injury. I was fortunate with the repairs done to both of my hands at the end of last year which went better than I had imagined. Now to the Krona, it is still one of the big bargains around. It has plastic handle and that keeps the buyers who want all metal away. It is slightly better than the Super Speeds of the 1950s and forward because of both the handle length and the head that requires more of a fixed angle shave like an injector. Great razor especially for the prices. I just bought one on eBay. Can't wait to get it, clean it up and shave with it. the version I have (Schick-Canada) is the all black plastic handle and knob with the chrome ring, but....one door says "SCHICK" and one door says "KRONA". great razor. package seems to indicate mfg. date as 1968 ? I guess there are actually quite a number of variants of this classic razor. You might also want to try the lady Gillette. It is really only a Super Speed head on a long handle. I'll PIF you this one if you think you might be able to use it, pal. I remember my mom having one of those. 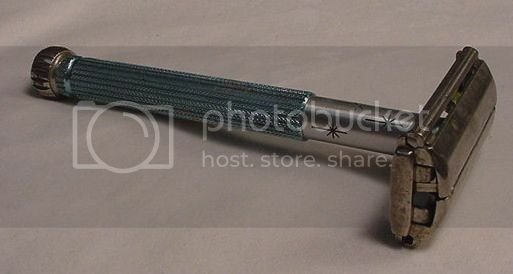 The blue handle and the star design on the shaft. After she went to a twin blade she gave it to me and I used it as a play prop with my STAR WARS AND SPACE 1999 action figures! Oh the humanity! Don't know what happened to it! If you ain't a LOSER, you ain't livin'!! Mailman delivered mble today. Black knob with Schick and Krona on the doors. Need to clean her up just a tad, but she'll be fine. (01-05-2013, 04:14 PM)Blue line Wrote: Mailman delivered mble today. Black knob with Schick and Krona on the doors. Need to clean her up just a tad, but she'll be fine. From everything I've read about this razor and its outstanding design, over the years, it would be very well suited to my needs if it came with a short, thick handle. Regrettably, that long, thin handle that is tapered at the top would not be comfortable for me. I saw a modification one time that involved putting Schick Krona doors on a Fatboy. The result was a lower profile head. I'd like to try that one day.